SNHR issued the monthly report that documented the government forces use of barrel bombs in March. The report stated that despite the Cessation of Hostilities taking place, but the Syrian regime did not stop bombing of large areas during the past month using explosive barrels. Certainly, the frequency of use of barrel bombs and the death toll has dropped its descendants. But explosive barrels, which are a random weapon, have the effect of massive destruction. That impact does not just stop at the killing of civilian casualties, but also causes residents’ displacements and terror in targeted areas. The throwing of the explosive barrels from the helicopter is considered as a savage way that leads to war. Thus, it is possible to consider each explosive barrel is a crime of war. 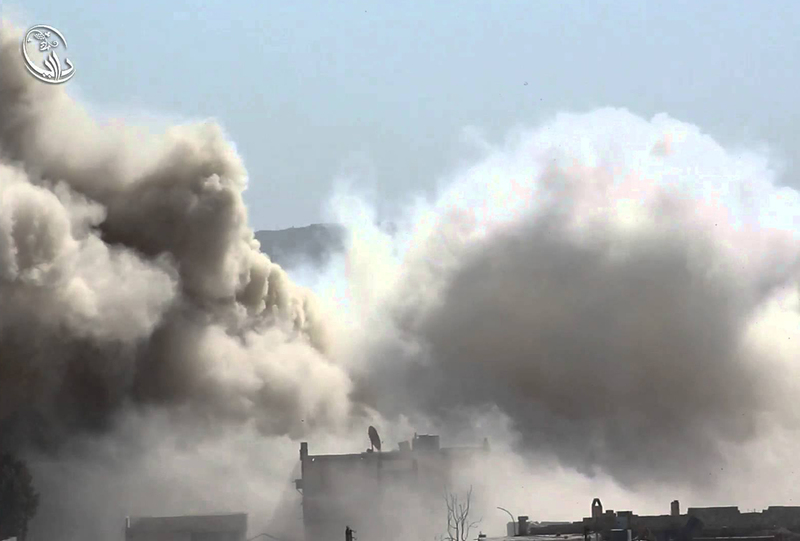 The report mentioned that the first use of barrel bombs by the Syrian government was on Monday 1st of October 2012 against Sqleen town in Idlib governorate. These barrels are random weapons and locally made, since it is less expensive, causes massive destruction, and causes a great loss of lives. 99% of the casualties are civilians, where the percentage of targeted women and children ranges between 12 and 35%. The report indicated that the SNHRs daily documentation proved that the Syrian regime doesn’t stop the killing and dropping barrel bombs Unlike the Russian ambassador’s announcement in the United Nations, that the Syrian regime stopped using barrel bombs. The report documented the toll of barrel bombs which were dropped by government helicopters in March which reached 241 barrel bombs. Most of them were dropped on Aleppo and Damascus suburbs then on Idlib, and caused the killing of 3 civilians including a girl and two women. The report confirmed that the Syrian government has, beyond any doubt, violated Security Council resolution 2139 and used barrel bombs in a widespread and systematic manner. Furthermore, the Syrian government perpetrated the crime of murder in a widespread and systematic manner according to Article VII of The International Criminal Court Rome Stature. Additionally, it violated many principles of the international humanitarian law and perpetrated tens of crimes that can be classified openly as war crimes through its indiscriminate and proportionate bombing. And it called to impose an arms embargo on the Syrian government and prosecute anyone who supplies the Syrian government with money and weapon considering that those resources are being used to perpetrate crimes and serious human rights violations.